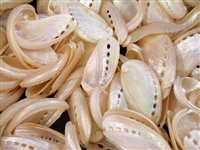 Home > Medium Sized Seashells > Abalone Pearlized - Small 2-3"
Small Pearl Abalone Shells 2" - 3" (50-75 mm) by the piece. Beautiful, hand selected Haliotis Asinina (Donkey's Ear) Seashells. 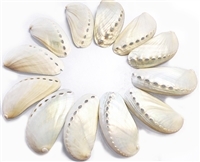 Light weight shell, great for all kinds of crafts and nautical decorating. 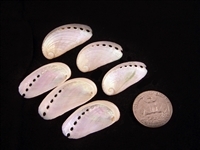 Set of 12 Small Pearl Abalone Shells 2" - 3" (50-75 mm). Set of 50 Small Pearl Abalone Shells 2" - 3" (50-75 mm).